In the six months since launch, we’ve released a bunch of new features. In fact, we just did a press release listing them. The goal of all these features is, of course, to help you close more business. But as we add more features, we also take up more of your precious email screen. And while we try to make every feature awesome for everyone, that doesn’t always happen. 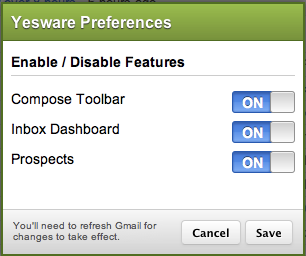 If you want to turn off any of the Yesware features, just hit the switch, click save and refresh Gmail. Voila! More control of your Gmail and Yesware experience. 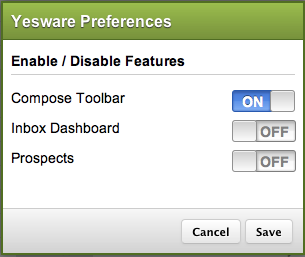 As we add new features, we’ll be including them in Preferences, so you can control exactly how much Yesware you want to see and use.